Summary: Bear has never celebrated Christmas, but his research has shown him what the most important element is: pickles. 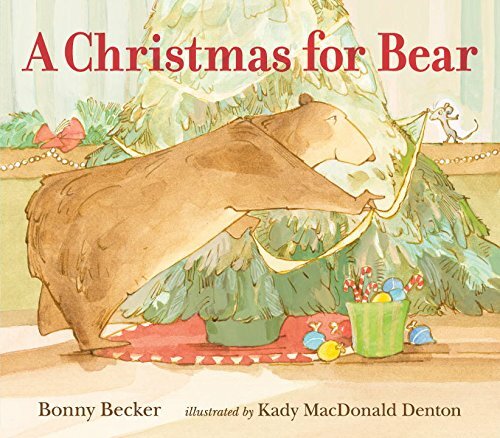 When Mouse comes over on Christmas Eve, he can’t help searching the house for presents, even as Bear is reminding him that pickles and poetry are what will make their holiday special. They sit down to the pickle-centered feast, and Bear begins reciting “The Night Before Christmas”. When he gets to the line about the stockings, he repeats it several times, growing increasingly loud, until Mouse realizes there ARE stockings behind the tree, and one of them has…a present! Mouse races outside to use his new telescope, and there, under the tree, is a sled for Bear. Bear struggles a bit, but manages to let Mouse know that he is Bear’s best friend. 48 pages; ages 5-9. Pros: Another winning tale of the unlikely but sweet friendship between Bear and Mouse. Cons: I was sweating it out about the presents; I don’t even like pickles.